One of the most favourites ways of using hamburg or minced meat is by making them into meatballs. They are a classic served with spaghetti. Plus we can’t forget about Swedish meatballs either. Making them used to be a hassle but those that are using the Meatball Magic say those days are behind them. 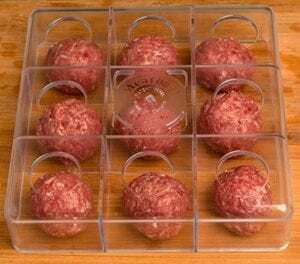 Meatball Magic is a simple gadget that allows the food preparer a simple way to make a large selection of meatballs. All of which turn out to be perfect in shape and the same size. The promoters of Meatball Magic are claiming that it only takes four easy steps to make the perfect meatballs when using Meatball Magic.Anyone can do it. There is a lot less mess when using this. The hype really revolves around the unity of the meatballs made with Meatball Magic. When they are the same size and are uniform they cook evenly. No more half under cooked meatballs while the rest are over cooked. The cost for Meatball Magic starts at $14.95. The price decreases with the more packages that are bought. Which is great for those that want to buy extra to give as gifts. The commitment for making the meatballs is still the same. You need to use your favourite recipe. Then you are ready to put Meatball Magic to good use. It only takes a few steps. The first thing you need to do is flatten out the meatball mixture on a hard surface. This is going to dictate the thickness of your meatballs. So if you want bigger ones don’t flatten out the mixture as much. Then the next step is to press the Meatball Magic gadget into the meat. It is an acrylic form. Now comes the magic. All you have to do is rotate the Meatball Magic gadget in a circular motion a few times. Finally just lift up the Meatball Magic device and you have a perfect set of meatballs. We think this is a great idea. The Meatball Magic is a real problem solver. Now all those cooks who have been refraining from making meatballs can get back at it. The family is going to love having meatballs and spaghetti, instead of a mere meat sauce. We are going to give the Meatball Magic a thumbs up. It is not expensive. It offers a perfect solution. Plus, the device is so easy to clean. On top of all of this it is a real time saver. Cooking can really take a lot of time. There is no doubt that the Meatball Magic is a time saver. But there can be additional time savers added to the kitchen. One that specifically fits in with the making of the spaghetti and meatball dinner. It happens to be the Fasta Pasta. It helps to cook pasta faster with no compromises. What do you think? Does Meatball Magic work or not?